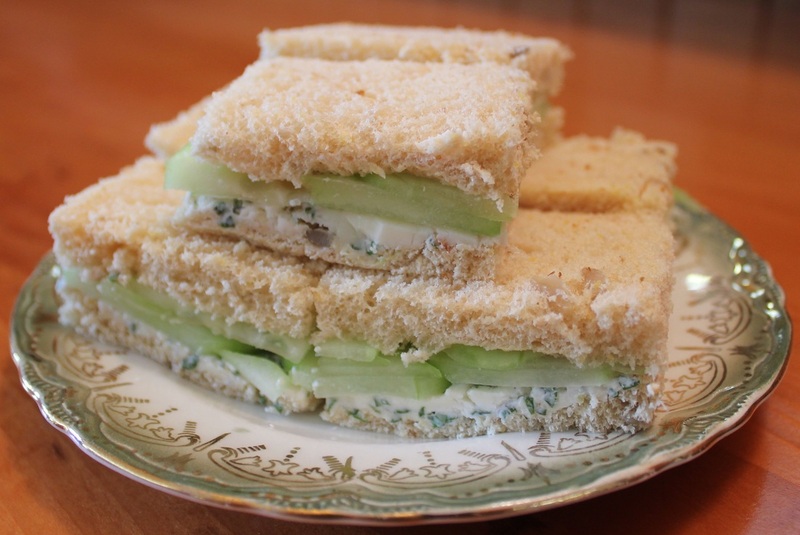 Great for a luncheon, tea, bridal shower or just a nice change for lunch, cucumber sandwiches are traditionally made with white bread. These are made with 12 grain, but you can easily use white, whole wheat or 12 grain bread. In a small bowl mix the softened butter, cream cheese, and chopped fresh mint. Spread 1/4 of the mixture on each of 4 slices of the bread. Layer 1/4 of the sliced cucumber on top of the butter/cream cheese mixture. Cut off the crusts and slice each sandwich into quarters.